For Thinning, PhytoCellTec Argan stem cells support vitality for stronger strands with less breakage as argan oil nourishes and conditions for flexible strength and smooth manageability. The result is noticeably fuller looking hair with amplified body, volume & shine. Aloe Barbadensis Leaf Juice*, Purified Water (Aqua), Sodum Chloride (Sea Salt), Polysorbate 20, Plant Stem Cells (Argan, Malus Domestica, Solar Vitis) and BioActive 8 Berry Complex*, Vitamin B Complex (Biotin, Thiamine, Pyridoxine, Niacin, Riboflavin), Hydrolyzed Rice Protein, Hair Regeneration Complex [Tussilago Farfara (Coltsfoot) Leaf Extract, Achillea Millefolium (Yarrow) Flower Extract, Cysteine, Glycyrrhiza Glabra (Licorice) Root Extract*, Equisetum Arvense (Horsetail) Extract, Spiraea Ulmaria (Meadowsweet) Flower Extract], Camellia Sinensis (White Tea) Leaf Extract*+, Hibiscus Sabdariffa Flower Extract*+, Tocopherol, Phenethyl Alcohol, Ethylhexylglycerin, Sandalwood Isolates, Citrus Grandis (Grapefruit) Peel Oil, Cedrus Atlantica (Cedarwood) Bark Oil, Cananga Odorata (Ylang Ylang) Flower Oil*. Spray evenly on clean, conditioned, damp hair. Air dry naturally, use diffuser, or lightly blow dry. 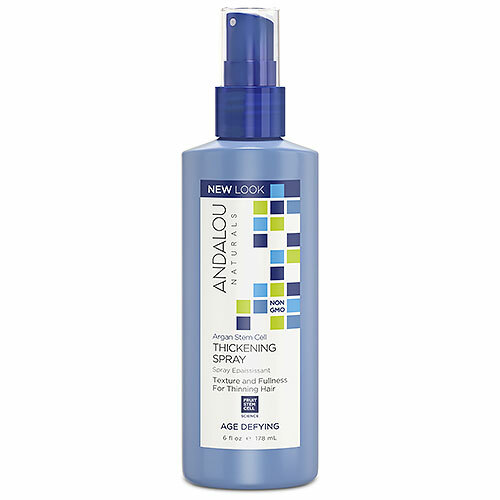 Spray anytime on dry hair for instant volume and texture. Gentle and colour safe. Below are reviews of Andalou Argan Stem Cell Age Defying Thickening Spray - 178ml by bodykind customers. If you have tried this product we'd love to hear what you think so please leave a review. For Thinning Hair, PhytoCellTec Argan stem cells support vitality for stronger strands with less breakage as argan oil nourishes and conditions for flexible strength and smooth manageability.